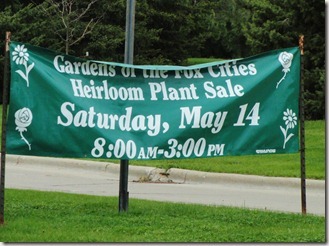 Last year, with great curiosity, I attended the Gardens of the Fox Cities’ “Heirloom Plant Sale”. I was pleasantly surprised that individual plants were sold. So this year I came prepared. I had done my homework before hand and jotted down a list of plants I would be happy to get. Last year I believe I came an hour or two after they opened and had to choose from a heavily pick over selection. This year I arrived with my coveted list just minutes after they opened for business. As I parked, already people were returning to their cars with their purchases. Drats! 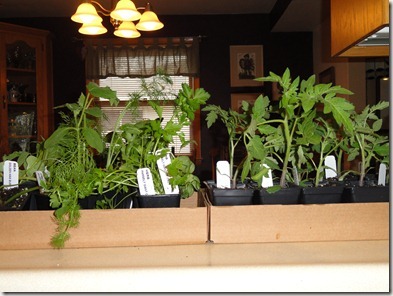 As I got inside the building and started looking, to my surprise, most of my list was available, so in a compulsive moment, suddenly I had 10 tomato plants! 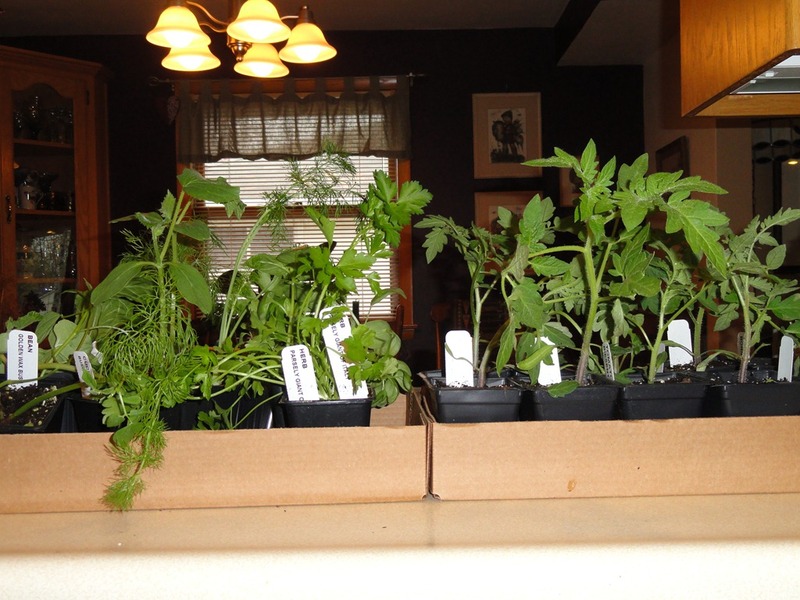 I was excited to have so many different kinds, a garden research project of sorts, I rationalized. Of course, I may be vending tomatoes at the Saturday Farmer’s Market in downtown Appleton, if these all do well. Yikes!! I also picked out some bush cukes, sweet banana and regular green peppers. The only thing that they did NOT have were the leeks. I was so looking forward to trying those. As you can see there are some very unusual varieties that range from pink to red to purple to mahogany. 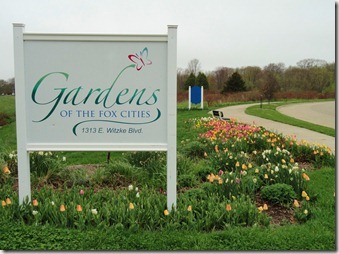 I am thinking this will be an exotic garden. But lots of fun. Although, due to their unusual colors, I hope I will be able to tell when they are ripe. 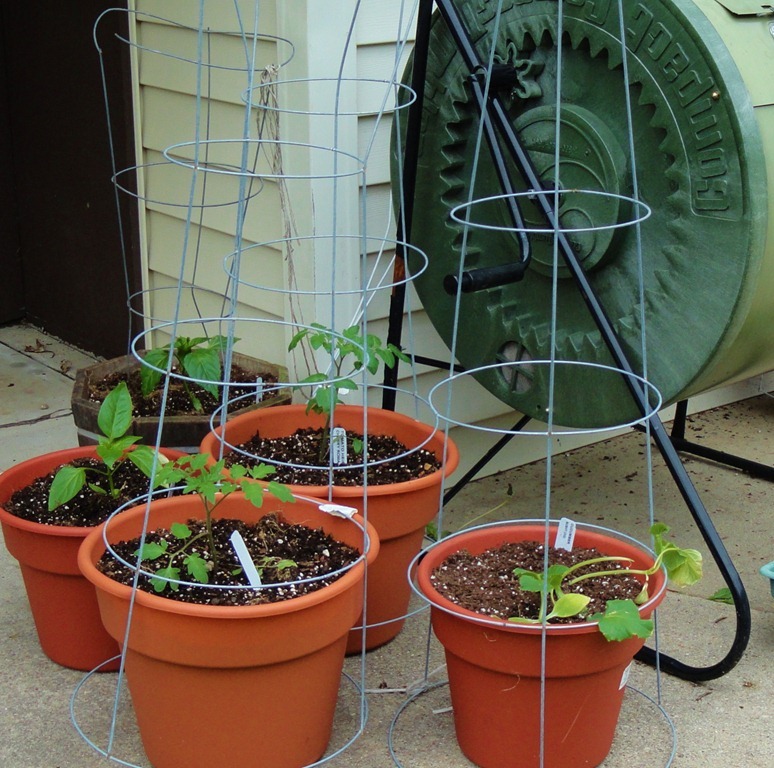 Well, once the plants were at home, I kept them safely inside at night and then carted them outside during the day to let their stems harden in the wind and to allow them to continue to grow. Yesterday, the weather forecasts predicted no more frost, so I decided to move to action. 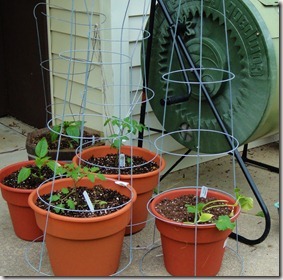 The plants were introduced to their new homes: raised garden beds and big container pots. 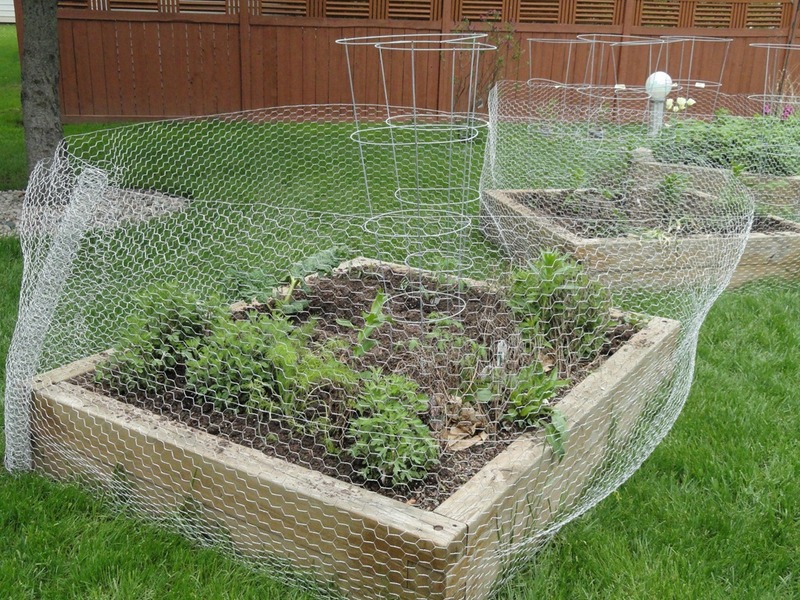 Unfortunately, rabbits are prolific throughout our neighborhood so Jon and I added a wrap of chicken wire fencing around the raised beds so the bunnies can’t do any late night munching. 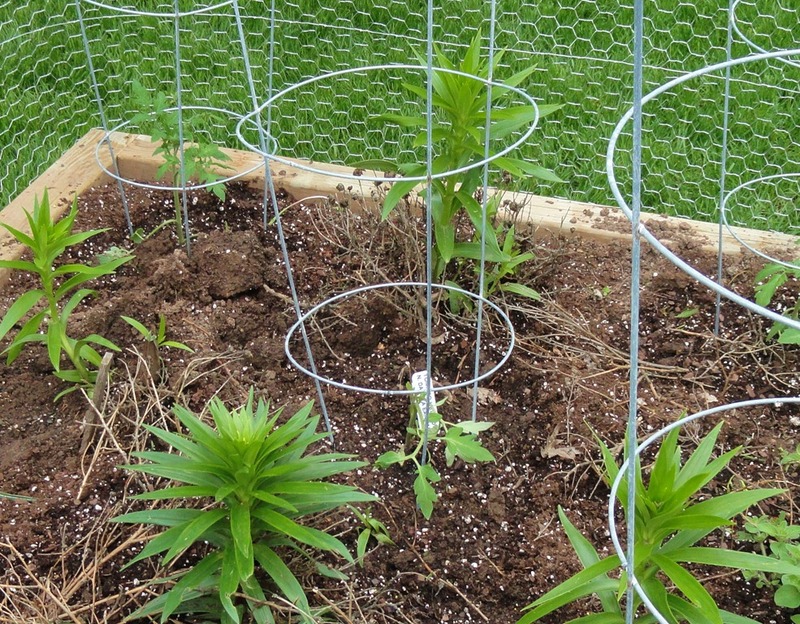 The esthetic beauty of the garden then went out the window and now the raised beds look like they are entangled in a mass of wild hair netting. I didn’t secure the fencing, so it should be easy to get in and out of the beds once harvest time arrives. 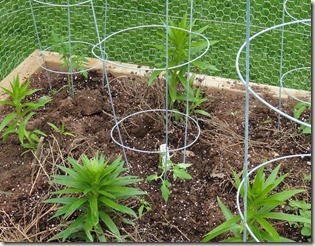 There are some lilies in one of the beds and last year they NEVER made it to bloom due to those wild wascally wabbits. They were the only plants the rabbits bothered in my yard. They are now safely protected within the wire compound and I am sure, breathing an easy sigh,now. 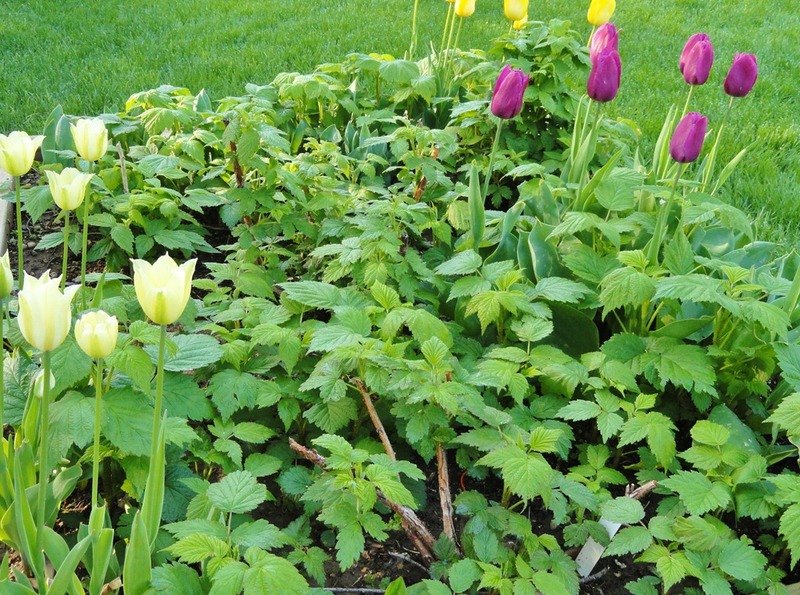 The third raised bed starts off in the Spring with tulips and ends with juicy raspberries. Boy! 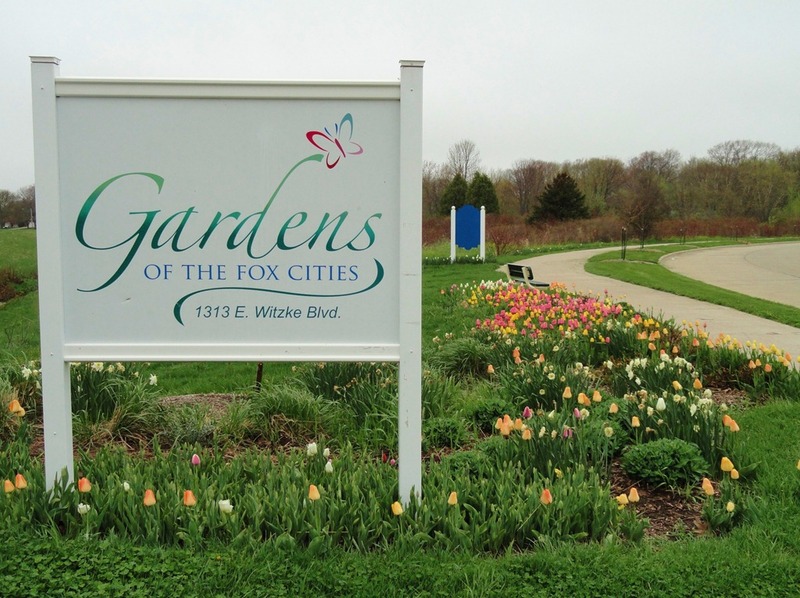 Did they ever spread inside that little garden abode. My backyard neighbor told me it was smart to have them contained or they would spread throughout the yard. I nodded, like I was aware of that. Secretly relieved it was a lucky garden move on my part. Now at last, we water, fertilize, and wait for consistent warm weather so they will thrive and grow!